My latest book, Gradle Recipes for Android, is now available as a “Rough Cut” at O’Reilly. You can get it at http://shop.oreilly.com/product/0636920032656.do. Rough cuts are preliminary versions of O’Reilly books, which are released while a book is still in progress, without special effort taken for formatting or anything else. In this case, however, the rough cut is pretty close to the final version. 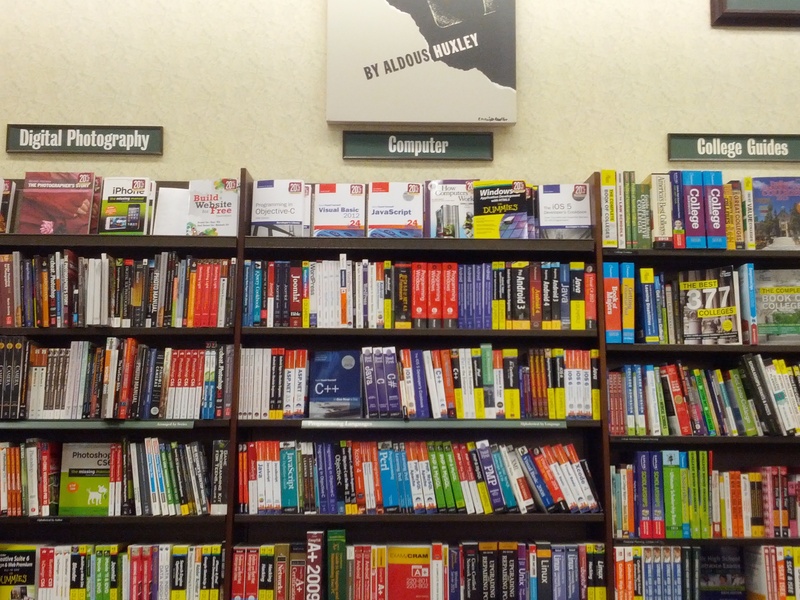 Recipe books at O’Reilly are like their cookbooks, only shorter. 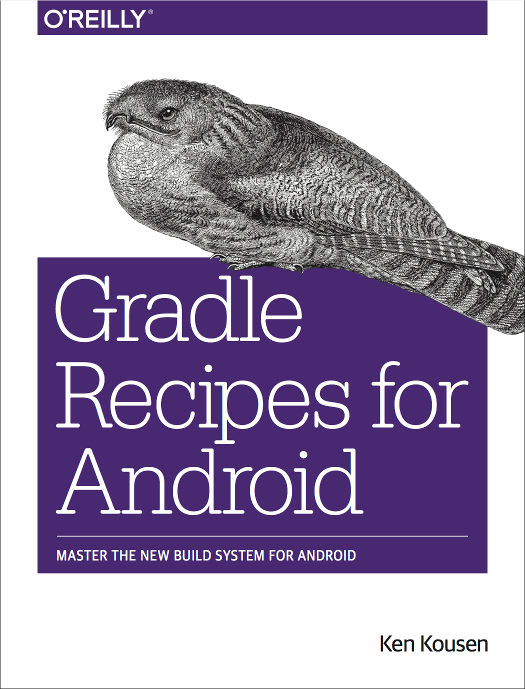 My book has about 27 recipes, which are short discussions of how to do specific tasks, in this case involving the Gradle build tool with the Android plugin, used to build Android applications. The book also contains information about how to use the only officially supported IDE, Android Studio. The O’Reilly authoring system supports Asciidoc, which is wonderful. I found it much, much easier to write my book using Asciidoc, commit it to their git repository, and then generate the resulting pdf afterwards. The book is available in Safari Books Online, too, which show it formatted for HTML. The results are very nice, and allow you to copy and paste code from the browser to your editor of choice. For the record, I wrote the book using the Atom editor from GitHub, which has a nice Asciidoc preview mode. All the courses are available for sale, or on Safari. The last one (Gradle for Android) is similar to the book, but the book has more depth, a different approach, and lots of reference information. The book has appendices on Groovy and Gradle, while the video summarizes both topics. I should mention in the midst of all this shameless self-promotion that there is also a Packt book called Gradle for Android by Kevin Pelgrims. Packt books vary wildly in quality, but Kevin’s book is excellent. In fact, it was so good, that (combined with the fact I’d already coincidently recorded a video course of the same name) I decided I needed to switch my book to the recipe style. His book is much more the traditional exposition, with chapters and depth. Mine is more the “here’s a problem, now here’s a solution” style. 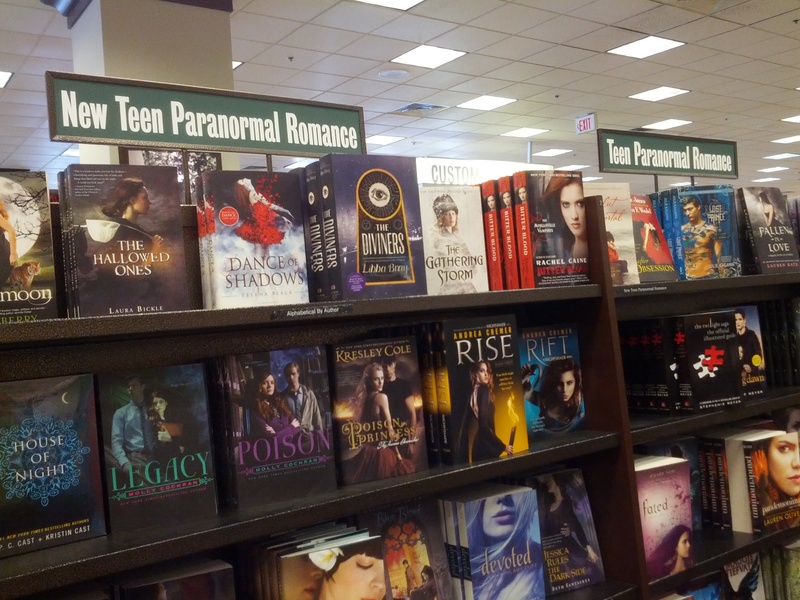 I think both books are complementary. At least I hope so. On an unrelated note, I now have a revised home page, http://www.kousenit.com. It’s about time. I hope you enjoy the book and/or video courses, or even just my new home page. As always, any errors or omissions are entirely my responsibility. I’m just happy to be making all this content available. Now I have to finish this weekend’s No Fluff, Just Stuff conference in Boston, travel to Raleigh for a Groovy course, and then get in line to see The Martian. Back May of 2010, my mother called to let me know that my father was going into the hospital for minor surgery. There was nothing to worry about, and no reason for me to drive all the way there just to see him, especially since he was only going to be in the hospital for about a day. My contrary nature, combined with my constant desire to exceed expectations, combined to make me seriously consider driving there anyway. I lived in eastern Connecticut, and my parents lived in York, PA, which is about a 5 1/2 hour drive, so it wasn’t a trivial undertaking. As it happened, this was a Sunday and I didn’t have a class the following week, so after talking to Ginger I decided to just go. I called as I got close, and they told me the surgery had been a success and he was fine, but they had received some extra news, so I should just go to the hospital. Between the time my mother originally called and when I got to the hospital, the doctors had run some tests, and they weren’t good. It took some time to confirm the results, but the diagnosis was clear — stage 4, grade 4, cancer. They gave him three to six months to live. Before this story gets unnecessarily maudlin, let me mention a few things. It’s been over five years and he’s still here, though he’s fading away by the moment. When he first told me the results, a look passed between us that was the culmination of all the years that had come before it. He understood what was happening and already accepted it. I understood that and was willing to go along with whatever he wanted. Even more, we both knew this wasn’t an emergency. It wasn’t like we had massive differences to resolve. We’d already been through all that. Everything that needed to be said had already been said, and we were fine now. All that was left was to make plans and enjoy each other’s company until the end. As we get older, we re-negotiate our relationships with our parents over and over again. We go through stages in life, from child to adult to possibly parents of our own, while retaining our ability to drive them crazy. They transition from supreme authority to advisor to friend and even dependent, while still retaining their ability to drive us crazy. We change, and they change, and the relationship has to change as well, which all too often isn’t easy. I returned to my home, of course. Those of you who have been through cancer, either personally or with a relative, know one of its most frustrating aspects is that everything happens in slow motion. You try a new therapy and wait before you can find out if it’s working. You run tests and wait until they show anything. You watch the quality of life deteriorate slowly, with occasional interruptions of good health and progress, before the inevitable sets in again. It can be a long drawn out process, except when it isn’t, which I imagine may be worse. I don’t know. I’ve only seen it this way. Over the years, we got in the habit of visiting them twice a year, over the 4th of July and for Thanksgiving, and they normally came to us once during the winter, with maybe another visit if it was convenient for some reason. The initial diagnosis was in May, so the next time I saw him was in July. He took me aside and showed me what he’d done in the meantime. First, he’d taken this picture of himself. It’s a good picture, which wasn’t terribly surprising. He’d discovered photography as a late-life obsession, and showed remarkable talent at it. That’s my dad all over. He always had a plan and he never wanted to be less than perfectly prepared for whatever came, and he cared for my mother more than anyone in the world. 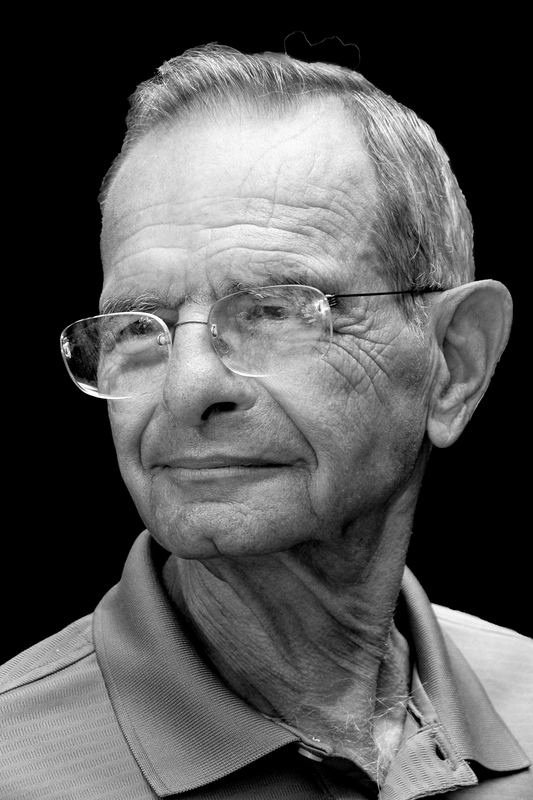 My father was born on August 2, 1938, near Washington, DC, the eldest of two sons of immigrants from Eastern Europe. He never liked the name Morton, so he went by Mort, which wasn’t much better. His parents didn’t give him a middle name at all, he didn’t have that as an alternative. My mother, Bonnie, was born in 1941 in a different part of Washington, DC. She was the eldest daughter of first generation US citizens. They married when she was only 19 and he was only 22, which is younger than my son is now. He graduated from George Washington University with a degree in Pharmacy, which he mostly hated. He then enlisted in the Air Force and received his commission as a second lieutenant. He wasn’t a flyer — he worked in a pressure chamber, eventually getting an M.S. in Physiology at the University of Illinois on his way to becoming a captain. Talking to him later revealed a lot about his life then. Once, early on, he was placed in command of a squadron. As a raw 22 year old he had no idea how to handle them. What he did have, however, was a very experienced master sergeant. Doesn’t that sound like management advice for the ages? It still makes me smile. Needless to say, they got along well and both did well. My father was transferred several times (such is life in the service). The only parts I remember where moving from Champaign, IL (where he got his master’s) to Peru, IN and then to Del Rio, TX. That last move wasn’t a happy one. He was hoping to go on and get a Ph.D. He was already accepted into a program in Amsterdam and was excited about relocating to Europe, though it wasn’t a sure thing. Instead, at the last minute, he was called into his commanding officer’s office. “Instead of going to Europe, we’d rather you get promoted to Captain and move to Del Rio, TX. How would you like that?” the officer said. “I wouldn’t like that at all, sir,” my dad replied. While in Texas, my father became friends with an obstetrician. Like all Jewish boys of his generation, my father had always been interested in becoming a doctor. His friend offered to take him to watch a delivery, which he did. The delivery was easy and successful and everyone went home happy. “Is that what made you want to go to medical school?” I asked. He told me his friend offered to take him to one more delivery. This time there were complications, and an emergency C-section, and lots of things happening all at once. Still, the result was a happy, healthy baby at the end. My father nodded to me. “That’s when I decided to become a doctor,” he said. The military isn’t terribly flexible, however. They weren’t willing to send him, because he was thirty years old at the time. My father applied to several medical schools anyway. He received a few interviews, including one at the University of Maryland. “I don’t think you’ll find a 22 year old with my qualifications,” my father replied. They accepted him. Then he went back to the military and told them he was in, so they should send him anyway. They said they could do that, but that the program resulted in a commission as second lieutenant. My father replied that he was already a captain. “Make it lieutenant colonel and we’ll talk,” he said. That wasn’t going to happen. They offered him a promotion to major instead, probably to forget the whole thing. He retired from the Air Force after 12 years of service, and, as we used to say, we all went to medical school. My mother got a job as a teller in a bank, then as a secretary at a police station. My father studied during the day and worked as a pharmacist in the evenings. On the weekends, my mother used to take my brother, sister, and I scrounging around the neighborhood for bottles to return so that we could take the change and get ice cream from the Good Humor truck. We didn’t have much money, but we didn’t feel particularly poor, either. We also knew it was temporary, and that we were all in this together. My allergies and asthma didn’t help, but they didn’t matter, either. On nights when my mother had to work late, my job was to take care of my brother and sister. I’d warm up the Spaghetti-O’s, make sure they started their homework, and sometimes put them to bed. I was seven years old at the time. We’d never heard of “latch-key” kids back then. It took a few years of therapy before I even mentioned it, because I hadn’t realized it was important. I just can’t believe how lucky we were that nothing seriously went wrong, though my sister tells me lots of things were happening I had no idea about, which probably isn’t a big surprise. After medical school, we moved to York, PA (this was 1974, I believe), where my parents lived ever since. My father loved, loved, loved being a doctor. He must have delivered tens of thousands of babies in the York area over the years, and while he got exhausted, he never minded coming in during the dead of winter to deliver another one. Since he was the Jewish partner in his group, he always worked on Christmas and delivered all the babies while wearing a Santa suit. My father could obsess like nobody I ever met. He would pick a topic, or an issue, or even just where to buy a piece of hardware, and beat it into the ground. He’d read every review, talk to every person he knew about it, and check out every detail before making a purchase. It was, frankly, exhausting for those of us around him. The keys were “optimize” and “maximize”. The thought that he hadn’t done the necessary work to prepare was an anathema to him. He couldn’t bear it. They say your greatest strength is often also your greatest weakness. In all my life, I’ve never met anyone who wanted to know more than my father. He felt this burning need to know what was next, in any topic, all the time. It’s a great asset, but it could be very hard on the people around him, especially when I was a young boy who idolized him and desperately wanted his approval. Any time I accomplished anything, he would want to know what’s next. “And then what?” was practically a mantra. There was never any time to celebrate. I had to correct any deficiencies and move on. Plus, he would tell me that he always wished he’d been born with my natural ability to learn, which he thought was a compliment, but came across as a dangerous form of jealousy. Particularly bad times would be when I’d stop working, for a variety of mental and emotional reasons. None of that made any sense to him. The thought that I was wasting my talent drove him up a wall. It took me literally years to come to understand that his pushing me to go further wasn’t really about me at all — it was how he drove himself, all the time. The inadequacies I felt at never being good enough for him were a child’s perception of an adult’s emotion that was never really directed at me anyway. Once I was able to relax a bit and not worry so much about being perfect all the time, I could look for his approval without fear. To my considerable astonishment, I discovered I’d had it all along. Frankly, he never understood my confusion. Chess. An early one, mostly before my time, but resulting in lots and lots of chess books around the house. I improved until I became his rough equal in high school and then leveled off. His style was to get bored and attack, just to see what would happen. My need to find the “right” move in every situation made those games tough, but we somehow managed to have fun anyway. About a year ago he was playing against my sister’s daughter and we finally decided to play again. That’s when I knew how old and sick he’d become — the fire was gone. He was almost defeated before we started. I hated it. We never played again. Radio controlled model airplanes. We lost our ping-pong table to that. He’d spend hours building them, then he’d fly them until they crashed, and start a new one. I can only imagine what he would do with today’s drones. Sailing. After a very brief experiment with a small power boat, he decided he wanted to learn to sail. He read everything imaginable, bugged all his friends about it, and over the years went through a series of increasingly large sail boats. I never liked sailing (even less with his persistent intensity around), so that was inflicted much more on my sister than me. My mother hated sailing more than I did, but of course she went with him until he became too old to do it any more. I’m sure there were more, but that will give you an idea. The obsessiveness came out even on little things, though. One day I was in his kitchen, reading something, when he wanted to know about a computer problem. Everyone in I.T. becomes the system administrator for their families, whether they want to or not. That has the unfortunate side effect of forcing you to deal with computer systems so horrible you normally wouldn’t touch them with a ten foot pole. In my family, that added another layer to the family joys of Thanksgiving, knowing that my father would have a list of accumulated problems he’d want me to solve, “but no pressure”. Yeah, right. One day I was sitting in the dining area reading something. I don’t remember what it was. It could have been as silly as catching up on my Twitter feed, but I was wrapped up in it and didn’t to leave. “Sure, when I’m finished this.” I replied. But it wasn’t okay, of course. He sat there for maybe five minutes, and then went over to the computer, opened that software, and proceeded to read all the menu items, one by one, out loud, as if daring me to ignore him. I was older, though. I acted like I didn’t hear him, at least for a minute. Then I heard one menu option in particular. “That could be it,” I said, angry for responding but unable to help myself. “I’ll go check the one in my office,” he said. I managed to stall for most of ten minutes, but eventually I had to go. He was in the process of his third reboot, with the Windows 98 (shudder) disks in hand because of problems. In fact, after talking to him, I couldn’t believe he hadn’t destroyed his entire computer. Somehow we got it working though, even if we never quite fixed the original problem. 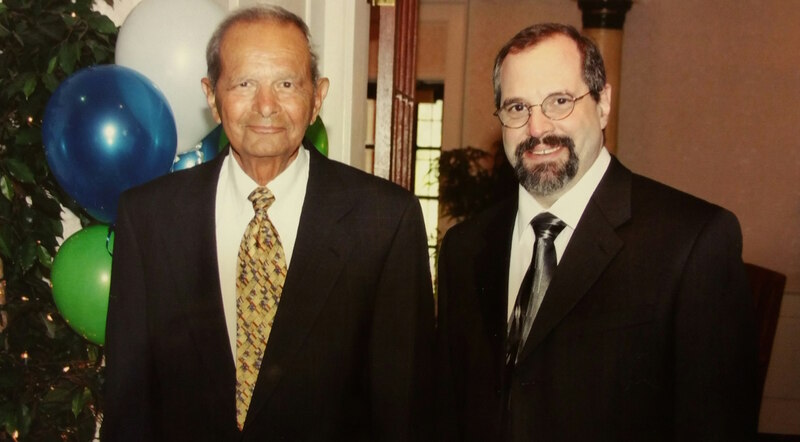 My father faced his illness with an upbeat and positive attitude that I found amazing. It never got the best of him, by which I mean cancer might have ravaged his body, but it never claimed who he truly was. Even more, he could rally for short periods of time when he felt it necessary. Here’s my favorite relatively recent picture of both of us, taken at my niece Jessica’s Bat Mitzvah in April, 2013. One last story. When my father was diagnosed, I had just begun work on my technical book, Making Java Groovy. I’d actually been working on it for a couple of years, but my original publisher cancelled it. I’d moped around for a month or so, and then managed to get it accepted at Manning. I’d just started at Manning the previous March. My goal was to somehow finish the book in time for him to have a copy. The diagnosis in May of 2010 made that look unlikely. He was just hoping to survive into November so he could make his 50th wedding anniversary. The initial attempts at radiation didn’t really help, so things were looking bad. Then they switched to a particular chemotherapy drug, and he improved almost immediately. That bought me time. Heck, it bought all of us time. I hadn’t realized that by moving to Manning I was going to have to re-write the book almost from scratch, but that’s what happened. The book took me years to write, and was eventually published in September of 2013. My plan all along was to get a picture of him holding the book, but for reasons I can’t begin to fathom, I never took that picture. I made sure he got the first copy off the presses, and he showed it to his friends, and celebrated it with me, but for some bizarre reason it never made it into a photograph. upbeat attitude, despite whatever pain and difficulties lay ahead. He will always be my best example of what a man should be. I wrote it while I was at his house, as part of the last steps of preparing the book for publication. That meant I had to write it and then not tell him about it for almost three months until the physical book arrived. He was blown away by it, which of course was the idea. I still don’t think I got it quite right. It still comes across as a bit awkward to me. But it was, and is, good enough. He’s still not quite gone. Last weekend he went into the hospital and nobody expected him to come out again. In fact, the ambulance drivers last Sunday didn’t want to bring him home because they didn’t think he’d survive the trip. He’s been lingering at home, not accepting any food or water, for eight days now. I didn’t know that was even physically possible. At least he’s got enough morphine in him to stop a charging rhinoceros, so I don’t think he’s in pain any more. We’re just waiting for the end. When he was first diagnosed, he told me my job was to give the eulogy. He felt it was important to him professionally to keep what he was actually like to himself, because he didn’t want it to interfere with his job, but when it was over he wanted people to know the truth. As a result, I’ve been thinking about this for over five years now, off and on, and this blog post is part of the result. I honestly thought I would have given it by now. I also feel that even though I’ve given you some idea of who he is, I’ve left so much out. He always put on such a bold, commanding front, but underneath he was such an incredibly gentle man. He could, and did, talk to anybody, and he did so with decency and respect regardless of position or what they could do for him. He also had very little patience, and a strong temper, and made astonishing social blunders. In the end, though, he’s my dad. He did his best, and he cared about all of us deeply, and I’m very grateful for that. When he was first diagnosed, we exchanged a look, and I think we both saw this day, and it was good enough. I’m really not a workaholic. I prefer days off as much as anybody. The problem is that there are all these things I want to do, so I volunteer to do them, and suddenly I’m overbooked so much I don’t have time for a break. I think part of it comes down to an acronym that’s making the rounds these days. It’s called FOMO, and stands for Fear Of Missing Out. I suffer from it as much as anybody, I guess. I’ll need to work on that. At any rate, I’m beginning a particularly busy part of my calendar, and I thought I’d mention it here in case I have the opportunity to meet any of you along the way. On Tuesday, May 26, I’m giving my Groovy Vampires talk at the Austin Java Users Group. I really have a lot of fun with that talk. I plan to update it a bit, especially because a recording of the version I gave at last year’s SpringOne 2GX conference is currently available on InfoQ. Instead of lamenting the decline of western civilization, I decided that what this meant was that I needed to add some Groovy vampires to my book. The talk is based on that, and involves accessing RESTful web services, parsing JSON data, using a MongoDB database, creating a RESTful service using ratpack and Grails, and more. The next day, May 27, I’ll be speaking at the Austin Groovy and Grails Users Group, this time on Testing Grails. While the bulk of the talk was created using Grails 2.3 and works under 2.4, I do plan to say a few words about Grails 3.0 as well. The testing mechanisms haven’t changed much in going from 2.3 to 2.4 to 3.0, though now they’ve added Geb as an included dependency, so you can make functional tests easily. If you’re in the Austin, TX area this week, please drop by and say hi. Also this week, starting tomorrow I’ll be hanging out at JavaRanch, because my Groovy Fundamentals video course will be featured in the Groovy forum this week. I’ve always been a fan of the ranch. I first joined way back in the late 90’s, when I was getting Java certified for the first time. Speaking of the Groovy Fundamentals video (did I really need to link to that again? Yes. Yes I did), that’s the first of three Groovy video courses I recorded for O’Reilly recently. It covers the basics, from POGOs to collections to closures, in almost exactly four hours. The second video course in the series is called “Practical Groovy”, and covers topics like integrating Java and Groovy, runtime metaprogramming, using AST transformations, the Groovy SQL class, and more. That one ought to go live within a week. The third video in the series is called “Mastering Groovy”. It covers Spock testing (though I use Spock tests in the earlier videos), working with Spring, JPA, and NoSQL databases, functional programming, traits, and RESTful web services, among other topics. That one will go live when I finally finish reviewing all the video segments. It’s rather dismaying to discover that reviewing six hours of video takes at least six hours. Though I must admit I’m tired of watching and listening to myself, I’m very proud of these videos and hope they’ll be helpful. I used to joke about selling the movie rights to Making Java Groovy, and speculate about who would I would recommend to play me. In essence, these video courses are that movie. They capture pretty much everything I’ve learned about Groovy over the years, condensed to an easily digestible form. If you’ve ever seen me give Groovy talks at No Fluff, Just Stuff conferences, you’ve seen a lot of what I’ve included, though with fewer jokes. That brings me to next weekend, which is the Dallas NFJS event. I’ll be giving a Spock talk, and my “Managing Your Manager” talk, and a series on Android development. Again, if you’re in the neighborhood, please drop by and say hi. Incidentally, some time this week (tentatively Wednesday, 5/27), Peter Ledbrook, Baruch Sadogursky, and I are planning to do another Groovy Podcast. I love doing those, so assuming that happens I’ll definitely tweet about it. From Dallas I’m off to San Diego, where I’ll be teaching a (private) Groovy and Grails class. Teaching technical training classes is What I Do, practically my raison d’être, so feel free to contact me for details. After the Grails class I’m heading to Sebastopol, CA, home of O’Reilly, to get back into the recording studio again. This time I’m working on a couple of Android videos, and if I manage to finish those I’ll also try to record something on Gradle for Android. That will all be the same week that culminates in the Gradle Summit in Santa Clara, where I’m doing an updated talk on the Gradle plugin for Android. I’m really looking forward to that conference, though I may miss the first day if we’re still recording. When the Gradle Summit ends, I finally get to go home again, at least for a few hours, before I’m headed to South Carolina for another training class. I might have another one after that, too, but I haven’t decided. Eventually I’m going to need a break, so it’s a good thing I scheduled one. Next year (!) my wife and I decided to go on the JoCo Cruise in the Caribbean, which is a sweet nerd cruise featuring Jonathan Coulton, Wil Wheaton, Paul and Storm, and many others. That really ought to be fun. Finally, I need to say something about “The Streak”. Like many people in the I.T. field, I was a career changer. I came from engineering. More accurately, I should say that I was a research scientist, specializing in the field of turbomachinery aeroacoustics. What that really meant was I did lots and lots of math and wrote lots and lots of Fortran (the nightmares have ended, but it took a while). Ultimately I joined an AI group, went back to school at night, got my MS in CS and decided to leave my job. My new job as a technical trainer started May 31, 2000. That day I helped teach a training course in Object Oriented Concepts (remember when did stuff like that?). I spent five years teaching classes (including roughly one Intro Java course a month back then) before I went out on my own in March of 2005. We’re coming up on May 31, 2015, and in all that time, I have never missed a day of training. Not one. I call that The Streak, and since it looks like I’m going to make it to that date I figured it was okay to announce it here. On today’s Groovy Podcast, I mentioned that I was teaching a Groovy training class this week at Research Now in Plano, TX. That’s not how I said it, though. I said that I was broadcasting live in front of a studio audience and that they were the most amazingly awesome group I’ve ever encountered. During the podcast, I told my inestimable co-host, Peter Ledbrook, that we got a chance to use GPars in class. The app we used it on was all about the primary goal of the internet, which is to display cat pictures. Peter then shamed me into writing a blog post about it, which you’re reading now. I’ve actually written about this app before, for another client. My post there was originally entitled, “The Reason The Internet Was Invented, Or Cat Pictures FTW”, but the host changed it to the far more mundane Calling RESTful Services in Groovy. The basic idea is that Flickr (remember them? Me neither) has a RESTful API that lets you search for photos. The “flickr.photos.search” request doesn’t require authentication, but does require a whole set of query parameters, including an API key. Funny story: in order to get a Flickr API key, you actually have to register at Yahoo! Remember them, too? Yeah, neither did I. The query string is constructed from the map of params by running a collect on each element (which returns key=value for each Map.Entry) and then joining the resulting list with an ampersand. Notice the tags key was assigned to the word “kitty”. The next part of my script writes out the results and appends them to a file. The Groovy string uses the farm, server, id, and secret elements of the response in each photo and builds a complete URL for the JPG image. Then I convert that to an actual URL and call getBytes() to return byte arrays. That uses the default pool size, which is the number of processors you have plus one. 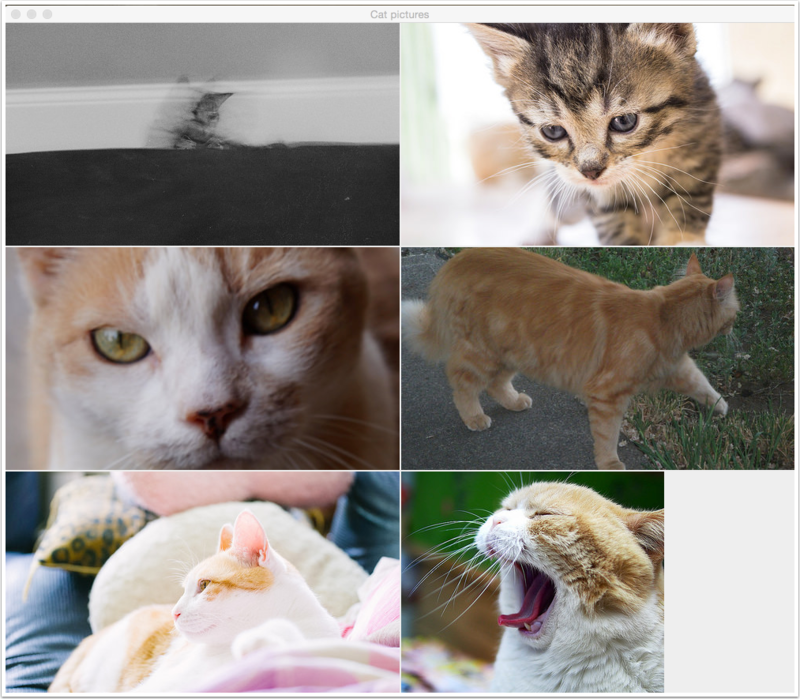 The images are now downloaded concurrently as part of transforming the photo elements into byte arrays using collectParallel. So there you have it, except for the stupid Flickr key, which I decided to let you register for on your own. Hey, I had to go through that pain, so everybody else does, too. Well, not everybody. As part of my pandering for evals technique, I did give my key to the students in my class, who no doubt will reward me with stellar evals once we’re done. Probably. It could happen. Either way, at least there were cat pictures, and that’s a Good Thing. The only problem is, whenever I post there, I don’t post here. I thought, therefore, that I’d add some links here to let everyone know what I’ve been writing about on their blog. Calling RESTful services with Groovy is all about using Groovy to invoke Flikr’s API for the reason the Internet was invented: Cat Pictures. That Which We Call A POGO, By Any Other Name, is a historical review of POJOs and POGOs, with Groovy AST transformations, and lots and lots of links to wildly unlikely resources that form the word POGO. Kicking AST and Taking Names is all about using Groovy’s abstract syntax tree (AST) transformations to dramatically simplify coding. That sounds dry, but it does have figures that reference CaddyShack, South Park, and even Gladiator, so it’s got that going for it. Which is nice. So if you’re enjoying any of my posts and you’re wondering why I haven’t been more active here, there you go. And wherever you go — (waits a beat) — there you are. This is a (mildly) embarrassing post, because it demonstrates how in my transition to functional programming I missed something important. I get it now, though, and I might as well help others avoid the same mistake I made. I teach a lot of Grails training classes, and one question that always comes up is how to map to existing databases rather than generate the schema from the Grails application. Hibernate (and therefore Grails) would love to generate the database schema for you, for a variety of reasons, but mostly because going the other way isn’t unique. You have to make a lot of decisions about a domain model when you reverse-engineer an existing schema, ranging from multiplicities in relationships to how to map many-to-manys to directionality and more. In my standard Grails course, rather than create a database we can map to, I go with an existing, freely available sample. For years I’ve chosen the Sakila sample database from MySQL. Over the years I’ve tried to map the Sakila schema to a Grails domain model, with varying degrees of success. I think I have it all worked out now, but that’s the subject for another blog post. Here, instead, I want to talk about stored procedures. Many of my clients want to use Grails with a database that has lots of stored procedures in it. Hibernate doesn’t like that. Hibernate wants to map all the domain classes directly to tables, without going through any possible intermediaries. While it is possible to invoke a stored procedure from Hibernate, it’s a bit awkward, mostly because Hibernate doesn’t want to do it. That’s where Groovy (as opposed to Grails) comes in. The Groovy API includes the wonderful groovy.sql.Sql class, which is a simple, but effective, façade over JDBC. That class will open and close connections, eliminate all the annoying boilerplate code associated with JDBC, and more. If I ever have to write raw SQL code, I always switch to groovy.sql.Sql rather than use JDBC. This assumes my call to the stored procedure happens in a class called StoredProcService. I have to use an integration test here, because I want to use the real database, but that means I can rely on Spring dependency injection to get the service into the test. Again, nothing terribly unusual here. The key observation is that the dataSource reference in the config file refers to a Spring bean, which can be injected in the usual manner. So I created a Grails service called StoredProcService and specified the dataSource bean as a dependency. The GroovyDocs for the Groovy API show that the groovy.sql.Sql class has a constructor that takes a data source, so I’m all set. Then, to call the stored procedure, I need to invoke the call method from that class. The SQL string uses the JDBC escape syntax for stored procedure calls. The params list take the input parameters and placeholders for the output parameters, and the closure is then invoked with the output parameters. The Sql class provides constants like “static OutParameter INTEGER” to represent output variable in the stored procedure call. Then the last argument is a closure that has as many arguments as there are output parameters (in this case, one, which I called count). Now, though, I have a problem. I’d like my callFilmInStock method to return the result of invoking the film_in_stock stored procedure, i.e., the count of films at that store. The problem is, I can’t just say return count inside that closure, because returning from a closure returns only from the closure, not the calling method. I’ve blogged about that before, and even submitted a variation to Baruch Sadogursky as a Groovy Puzzler, but this is where I first encountered that problem. This works, and (sigh) I’ve been teaching this approach for some time now. I’ve always been uncomfortable with it, though, and when I started digging into Java 8 lambdas I realized why. I’m using a closure here and relying on it having a side effect, which is to modify a variable defined outside the closure. In fact, in Java 8, lambdas are definitely not supposed to do that. The only variables lambdas are supposed to access from outside the lambda are those that are “effectively final”, meaning they’re never modified. Groovy closures don’t have that limitation, but I still had this nagging feeling that I was, as they say, doing it wrong. Last weekend, the new NFJS season started for me in Minneapolis, and I got a chance to talk about this to the inimitable Venkat Subramaniam, who writes books on this stuff (among other things). After I explained the problem, he thought about it for about five whole entire minutes and said that I should be passing the method a closure, not returning an integer. This test passes just as the previous one did, even though the method return type is now void. That’s the part I never got before. The groovy.sql.Sql.call(String, List, Closure) method takes a closure as its last argument, which means I can supply the closure myself and the method will use it with the returned count. When I learned about functional programming, I got the idea of transforming collections rather than iterating over them, and using filters to select only the values I want, and reducing the results down to single values. I got that I’m supposed to favor immutability wherever possible. What I apparently hadn’t grokked was sending closures as method arguments and how that simplified everything. I’m still not sure I’m all the way there, but I’m certainly a lot closer now. Over the weekend I tweeted that Venkat had fundamentally changed my understanding of functional programming, which is both cool and seriously annoying. Frankly, those are also words I would use to describe Venkat. If he wasn’t such a nice guy, he would be insufferable, mostly due to sheer jealousy. But we rapidly learn on the NFJS tour never to compare ourselves to Venkat in any way or you’ll just drive yourself crazy. Just don’t tell him I said that. When I first starting learning Groovy in a serious way, one tool I enjoyed was listening to the Grails Podcast. Glen Smith and Sven Haiges led a discussion about Grails-related issues on a regular basis. Of course, since they talked about new developments in Grails, they also had to cover new developments in Groovy, so the podcast was a valuable resource for both. At the beginning of each podcast, Glen would say that he was podcasting from Canberra, Australia, and Sven was podcasting from San Jose, California. Of course, Sven might have been in CA, but Sven is actually a European and eventually moved back to Munich. That led me to contact Glen and ask to be the third person in the booth, arguing (a) that they needed an American, too, and (b) together we’d be Glen, Sven, and Ken, and how cool was that? The Grails Podcast went on for several years, but underwent significant changes over time and became far less frequent. Eventually Peter Ledbrook (inimitable co-author, with Glen, of Grails in Action) took over, and a year ago he renamed it the Groovy Podcast. Meanwhile, whenever I saw Peter at a conference, I casually mentioned that I wanted to be involved in the new podcast. Finally, last year at the SpringOne2GX conference, Peter finally broke down and said he’d be willing to let me work with him. Okay, that’s perhaps a bit too self-deprecating, but when you want something like that you have to keep prodding until they say yes. I often tell my son that in order to be at the right place at the right time, you have to be at the wrong place at the wrong time a lot. So, in the end, I’m very happy to announce that I’m now the co-host of the Groovy Podcast. Peter uses Google Hangouts to record the podcast, so anyone can join in real time. The results are published in the Groovy Podcast YouTube channel in video form and on PodBean for those who just want the audio feed. I participated in episode 6 back on Feb 5, and we just recorded and published episode 7 on Feb 20. The goal is to get the podcast back on a regular, two-week schedule, which should make it easier to build a following again. Episode 5, from January, included a discussion with Groovy project lead Guillaume Laforge and Grails project lead Graeme Rocher about the change in Pivotal support for the projects, so that one is worth watching regardless. I should also mention that the show notes for the last couple of podcasts are available on GitHub. That’s now a public repo, so anyone can see them and potentially suggest topics for future discussions. So far I’ve written this post assuming you know me already, but it’s possible that you found this from the podcast itself and are wondering who I am and why I would have anything productive to say about the Groovy ecosystem. Let me present a short bio here. My name is Ken Kousen. The last name is pronounced as though it were spelled cousin, like the relative, for reasons unknown but probably having something to do with my grandfather’s very heavy eastern European accent. I’ve been working with Groovy since late 2006, but much more as a user than as a contributor. Eventually I started writing about the language, and my book on adding Groovy to Java projects to make development easier, entitled Making Java Groovy, was published by Manning in the Fall of 2013. I’m currently working on another book, this time from O’Reilly, entitled Gradle for Android, covering the new Gradle build system for Android projects. That book will be available in early access mode Real Soon Now(TM). I run a one-person company called Kousen IT, Inc., where my day job is teaching technical training courses on all areas related to Java, specializing in open source projects like Spring, Hibernate, Android, and naturally Groovy, Grails, Gradle, and more. I do some consulting and mentoring as well, but my schedule tends to fill with training classes so quickly that it’s hard to arrange for other activities. I’m also a regular speaker on the No Fluff, Just Stuff conference tour, which meets on roughly 20 to 25 weekends a year at various cities throughout the U.S. On the tour I mostly speak about Groovy-related projects, but I also discuss Android, Java 8, and a few other areas like Bayesian statistics and even “Managing Your Manager”. In fact, my “Managing Your Manager” talk has been sufficiently well received at previous conferences that it will be the opening day keynote at the DevNexus conference in Atlanta the week of March 9, 2015. I’ve also spoken at the U.S. version of the Gr8 conference several times, and (spoiler alert!) will be giving a keynote there in July discussing The Mobile World and Groovy’s role in it. Please feel free to contact me with questions, comments, or any good IT-related jokes, which I’ll freely reuse and even give you credit/blame if you want. If you and/or your company are interested in training classes, you should definitely contact me sooner rather than later, because as the Groovy Podcast explodes in popularity and my reputation skyrockets as a result, my prices will no doubt also become appropriately astronomical. So get your requests in now, while I’m still a relative nobody, at least compared to Peter. Okay, I’ll stop now. Let’s just say I’m really happy to be here, and if you’re at all interested in the Groovy world you should enjoy the podcast. We’re certainly having fun making it.